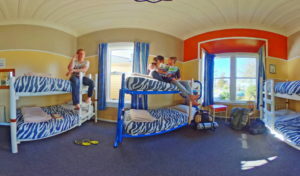 New Zealand accommodation options are diverse, with something for every level of comfort and budget. You’ll find a wide range of accommodation in most city centres. However, some of the more scenic locations only offer campsites. Obviously as backpackers we favour hostels and camping grounds/campervans to motels and hotels but if your privacy matters and you are looking for a single room, sometimes motels are the way to go. If you are looking for long-term accommodation, check out our page about “Long term accommodation“. Hostels have very good reputation in New Zealand. As a great country for backpacking, there are hundreds of hostels to stay at throughout New Zealand. Hostels will usually have shared facilities like bathroom, kitchen, laundry room, and lounge. Plus, some will have a few added extras like sauna, BBQ area and spa pool. You will be supplied with bed sheets, blankets and a pillow – most hostels have a “no sleeping bag” policy. Dorm rooms: From 4-bed dorm to 12-bed dorm, most hostels offer a choice of male, female and mixed options. Private rooms: This is just a bed in the room. You will still share the rest of the facilities with others. Private Room with ensuite bathroom: This room will have a private bathroom. Usually at this price you are better off in a motel, as most have great options like spa pool or sauna. Finding people to travel with. Usually you can get a WiFi connection. They tend to have at least short-term luggage storage. Use their job listings board. You can work for accommodation.